Sales and operations planning (S&OP), sometimes known as aggregate planning, is a process where executive level management regularly meets and reviews projections for demand, supply, and the resulting financial impact. S&OP is a decision-making process that makes certain that tactical plans in every business area are in line with the overall view of the company's business plan. The overall result of the S&OP process is that a single operating plan is created that identifies the allocation of company resources, including time, money and employees. Companies that use S&OP can give a number of benefits such as a greater visibility of the demand and supply across the enterprise, improved inventory management, increased promotional planning, increased accuracy in budget forecasting, and an improved product lifecycle management process. Whereas strategic planning looks at the company's plan years into the future, tactical plans look at the company's business plan over the coming year. Tactical plans take into account overall strategies of the company, which are found in the strategic plan. Sales and operations planning is aimed at helping companies develop and align the tactical plans developed by the various business areas. There are two approaches that are used in sales and operations planning; top-down planning and bottom-up planning. Top-down planning is the simplest approach to sales and operations planning. In this approach, there is a single sales forecast that drives the planning process. The forecast is derived from a combination of products and services that require similar resources, for example, a number of manufactured finished products. Using top-down planning, the management can create tactical plans based on the overall forecast and divide the resources across the finished foods in the plan. This approach is used by companies that do not have a stable manufacturing schedule and the number and type of finished goods can change from month to month. In this scenario, the sales forecast is not helpful for resource planning. The management needs to calculate the resources for each of the products and then amalgamate the resources to get an overall picture of resource requirements. After a company has worked through their sales forecasts and calculated the resource requirements, the various alternate production plans should be generated. There are three approaches that are used for the production plan: ​level, chased, and mixed. The level production plan is used where the cost of making a change in the production level is extremely expensive, while the cost of holding inventory is very low, for example in the oil industry. Using the level production plan, the production remains constant and inventory is used to absorb the differences between the sales forecast and the production. The chase production plan is the opposite of the level production plan. In this production plan, the production is changed for each time interval of the plan to match the sales forecast for that interval. With this approach the production is always chasing the demand, hence the name chase production plan. This approach is best used for companies who either cannot hold inventory. Otherwise, to do so is extremely expensive, while changes in production cost very little. The mixed production plan takes elements from both the chase and level plans, where there will be variances in production and inventory levels which will produce the best production plan. It is more important to streamline a company's processes to gain competitive advantage. 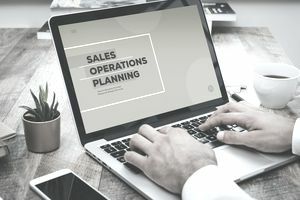 Companies that have an effective sales and operations planning process are improving their visibility across their enterprise. They are able to improve product management, improve promotional planning, and minimize unnecessary buildups of inventory. What Is Kanban in Small Business Supply Chain? Which Supply Chain Metrics Are Right For Me? What Do Companies Need Tactical Supply Chain Management?